Burmese pro-democracy leader Aung San Suu Kyi has made her first political trip outside Rangoon since her release from house arrest last November. 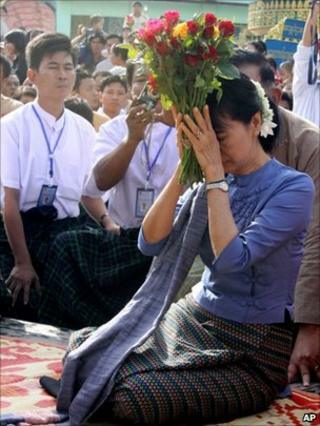 She called for national unity as she visited Bago, about 80km (50 miles) north of Burma's main city. Thousands of people lined the streets as her convoy made its way to Bago. The Burmese authorities had earlier warned that such a trip could trigger unrest and security agents were monitoring the convoy. However, the BBC's South-east Asia correspondent, Rachel Harvey, says recent moves have suggested a thaw in relations could be under way. Ms Suu Kyi travelled in a three-car convoy that was followed by a host of vehicles carrying reporters and supporters. Thousands of people lined the roads in towns and villages on the way to Bago, waving banners and shouting slogans. Our correspondent says many simply wanted to catch a glimpse of a woman held for years under house arrest. At a pagoda in Bago, crowds shouted "Long Live Daw Aung San Suu Kyi!" Well-wisher Ma Thuza told Associated Press: "I can die happily now that I've seen her." Ms Suu Kyi, 66, delivered a speech to about 600 people as she opened a library in Tha Nat Pin, close to Bago. "We can develop this country only when we all work together," she said. "Unity is a strength, unity is needed everywhere and it is needed especially in our country." She vowed to continue her work "as much as I can". Security was a major concern for the trip. On a similar excursion in 2003, her convoy was attacked by a group widely believed to be linked to the old military government. The incident left several people dead and resulted in a seven-year period of house arrest for Aung San Suu Kyi. But, our correspondent Rachel Harvey says, times have changed somewhat - a new nominally civilian government is now in place and in recent weeks it has shown a willingness to try to reach an accommodation with Ms Suu Kyi. This visit will be a test of that accommodation, our correspondent says. There have been two rounds of talks between the pro democracy leader and a government minister, with both sides expressing a desire to cooperate for the good of the country. Ms Suu Kyi has made one trip outside Rangoon since her release from house arrest. She visited the ancient city of Bagan last month on a private pilgrimage that contained no speeches. Ms Suu Kyi's NLD party won an election in 1990 but was never allowed to take power by military rulers. An election last year was won by parties linked to the military but was boycotted by the NLD amid complaints of vote-rigging and intimidation. Ms Suu Kyi was released from seven years of house arrest after the November poll.